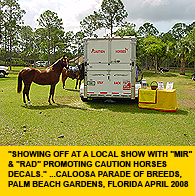 CAUTION HORSES Safety Products™ is the original company dedicated to creating driver awareness of horse trailers on the highway during the day as well as the night and with a national and international advertising campaign and retail distribution network that reaches around the world. Our product line was custom designed with the customer in mind. 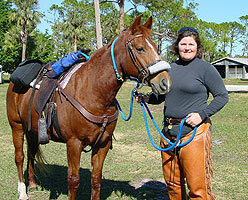 Our Marketing Director, Deborah Darwin has been working with CAUTION HORSES Safety Products™ since 2000. 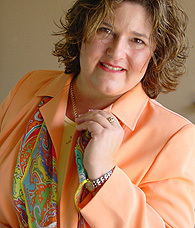 Deborah grew up in Pittsburgh, Pennsylvania and is a graduate from The Pennsylvania State University, with a Bachelor of Science degree in Agricultural Science. 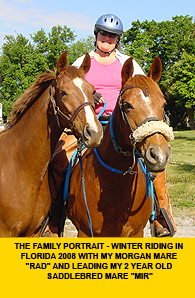 Deborah has been involved with horses since then age of 11 and has worked as a professional in the horse industry since 1981. 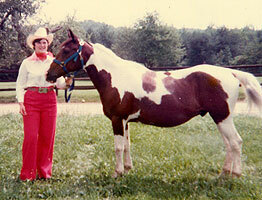 With the purchase of her first horse trailer, Deborah asked the sales person if they had a CAUTION HORSES sign they could put on the trailer and the sales associate said, "No." She then went down to the local sign shop where she left her trailer for 3 days, while they made a sign. After realizing that the sign took 3 days and cost about $45.00, she thought of a plan to mass market and produce the signage for horse trailers at a reasonable price. 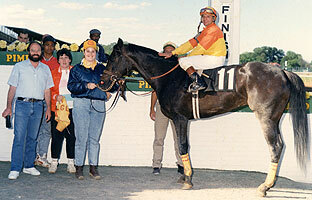 Thus CAUTION HORSES Safety Products™ was started. After Noticing more trailers on the highway without proper safety reflective tape and other accessories we started to develop our own line of horse decals known as CAUTION HORSES Reflective Horse Decals™ , so as to be different and unique to the industry making sure that our designs where confirmation as well as riding discipline correct. Since our beginnings, more ideas and better products have been produced to create driving awareness on the highway. Every year we try to come out with unique products that will accommodate our customers with quality products. Being an original designer and setting a standard for the industry is not an easy task, but with the help of customer suggestions and direction we can design the perfect products. 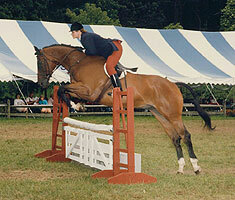 New Sign "STAY BACK 200 FEET"
WIDE TURN Signs, exclusively designed by Needlepoint Farm, Inc. for CAUTION HORSES.